What Does the Code of Conduct Change for the Moderator Teams? Primarily, not much has changed. The main difference for moderators is that the new CoC is designed to make the rules that we already have easier to enforce more consistently, and without as much worry of rule-lawyering and the emotional labor that it brings. The updated Code of Conduct emphasizes our desire to continue to build communities that are rooted in kindness, collaboration, and mutual respect. These are ideals that you’re already supporting and have helped improve. The CoC doesn’t create new rules, it just helps you enforce what we’ve already been doing. We want you to know that you have our full support when enforcing the CoC. Let’s continue to create a space that welcomes people for who they are – individuals wanting to learn, share, and level up. It is important now, more than ever, to live out the CoC and lead by example. We must show that this is who we consistently are, whether we’re dealing with community members or our fellow moderator community in the Teacher’s Lounge. During these interactions, let’s remember that all feelings matter, they don’t require evidence to validate their existence. That doesn’t make those feelings right but it also doesn’t mean that they’re any less valid. If you find that a conflict has arisen over the discussion of something about another member of our community, such as their identity, religion, gender, political affiliation, books on their Amazon wishlist, etc — you should immediately call the usefulness, and possible hurtfulness of that discussion into question and probably stop having it. Also, remember that it’s normal to not have an opinion on something – don’t feel like you need to have a fully formed stance on everything you encounter just because you’re a moderator. Sometimes it’s going to take a bit more research to feel fully informed about a specific topic. If something is unknown, it’s alright to move on or ask for help. As you interact with the many members of the community, remember that you will face individuals that can bring opportunities for conflict. We don’t have to agree with everyone and everything, but we do want to show respect and kindness. Sometimes setting a good example means openly admitting that you’ve got a lot to learn about something. Everything we’ve said serves as an encouragement since you’re already doing this across your sites! Thank you for continuing to be proactive and engaged. Your dedication to your communities helps to make them shine and we’re very proud of what you’ve been able to accomplish! While the data is still new and fluctuating, we’re noticing that folks in our communities are taking earnest stock of how their interactions contribute to how folks experience the sites, and this would not be possible if it weren’t for all of you patiently watching, and intervening gently, where necessary. As the CoC evolves, and we learn new strategies for enforcing it in a way that openly encourages people to be who they are and express themselves freely (within limits), we’ll continue to share what we know with you. So far, you’ve done quite a bit with very little input from us, and we’re extremely proud of how well you’ve done. New themes will start rolling out this month! We’re in the process of rolling out new network site themes this month. This means, if you’re a moderator of one of the 100 sites that currently use the stock ‘beta blue’ site theme, you’re soon getting a whole new look. This has been announced and discussed well in advance, but we want to let you know just in case your users have questions and you want a resource to point them to. It’s up to you if you feel like you should post something on your meta site, we just want to make sure you and your users aren’t caught off guard. Post-related moderator tools that were formerly located on the lefthand margin, have now been moved into the posts themselves. They are now listed vertically beneath the vote display for a post as a series of icons. With this, access to a post’s moderation timeline or comment/flag history can once again be accessed with a single click. By becoming part of a post, this means it will be accessible no matter the window width, even on mobile devices. Note that no changes to the tools themselves have been done. It’s only the appearance and location that has been changed. The second draft of the new CoC is now out for comment. If you didn’t notice it in the community bulletin, there’s a new post on MSE inviting folks to provide any final commentary on our second iteration of the new CoC (code of conduct). Many moderators provided us with some very valuable feedback, and we feel that you’ll be pleased with the amount of your feedback we’ve incorporated into this second draft. Our goal has always been to make it easier for you to enforce rules that we already have, and we feel that this accomplishes that. If you look closely, you’ll see that we’re not adding anything new, we’re just clarifying what we already have. Enforcement doesn’t really change much, except that we explicitly call out certain behaviors (like subtle put-downs, sexually suggestive phrasing in chat, etc) that some folks prefer to argue as ‘not technically not nice’ instead of just stopping. We hope this prevents time-consuming conflict by putting a stop to quite a bit of rule-lawyering. Please have a look, and let us know if you have any thoughts by leaving an answer or a comment (answers are ideal). Tim Post will be in the TL most of next week to answer questions in the context of specific cases that can’t be discussed publicly. You can also contact him directly at tpost@stackoverflow.com. Juan-at-large: New resources for the network! In case you missed his post, Juan Garza is going to be transitioning from managing the international Stack Overflow sites to leading a small team tasked just with helping the Stack Exchange network stay healthy and grow. Juan comes from an ‘old school’ community management background, where he helped companies build communities around topics from the ground up, and all he had to work with was his keyboard and some yucky forum software. He’s done an amazing job with helping our international sites take root, and we’re excited to reinvest his talents back into the entire network. There will be more from Juan in the coming weeks, we’ll make sure that moderators stay up-to-date on any new initiatives through meta and this newsletter. Last call to update your contact email address. In the last newsletter, we asked that everyone take a moment to make sure the email address we have on file to send you mail is actually a valid email address that you check semi-regularly. We’d like to send our thanks to everyone that made updates, you’re awesome! We’re going to be sending out more invitational things that are just for moderators (including private links to participate in the new engagement survey) as early as the end of next week. If you have not already done so, please make sure your information is up-to-date. Please set up a confirmed email address in the system. We’d like to be able to reach out to you for important things, and we need to make sure that we have a working e-mail address on file for you that you check with regular frequency. To check how you have this set and update it if necessary, go to yoursite.stackexchange.com/users/edit/current and check the email configuration. Arranging elections and confirming moderator active headcounts on the site. If it’s not something that requires a direct response, it would be something Earth-shattering important that we absolutely need you to know about as soon as possible. An example of this would be an account with moderator access showing signs of being possibly compromised. Please don’t forget to take a few moments and make sure you’ve got a valid email that you actually check at least semi-faithfully on file. The first annual moderator engagement survey launches soon! An option to have someone from the company get in touch with you (email, phone, carrier pigeon, whatever works for you). The survey is completely optional and anonymous; aggregate data that is not free-form in nature will be made public in a way that doesn’t identify individuals. There will be a place for you to include a link to your profile so that we can collect more context around your responses, but it’s in no way required, and not including it won’t make your responses less useful to us. We’d like to give folks a week to make sure their email addresses on file are current (see above!! ), and then we’ll send links to participate in the survey privately. The first Code of Conduct RFC is open. In case you didn’t see it, we’ve published our first draft of our new code of conduct for public commentary. This is, as the post says, just the first draft of something a bit more substantial than our current “Be nice” policy. Our expectation is, when finished, the code of conduct will allow moderators to remove hurtful comments that harm the image of their communities without as much arguing over whether something was technically rude or not. One of our major goals is to set people’s expectations that the intent of the document should be observed, without rule-lawyering parades presenting toxic behavior as acceptable or encouraged. While the code of conduct will apply to all contributions on the sites, the major problems we’re trying to solve most often manifest in comments. While it might seem tempting to solve this issue by feature changes that simply give comments less visibility, we feel that it’s better to eliminate hurtful things than hide them. A snarky comment left unmoderated for 2+ years could be the single thing that deters a potentially great contributor from engaging on your site, and solid codes of conduct help folks feel safe about joining a new community. As we post follow-up drafts following the incorporation of feedback both from meta and UX research interviews, we’ll make a mention of it in this (now bi-weekly) newsletter, just so you don’t miss them. If you have feedback you’d like to express privately, you can email Tim Post directly at tpost@stackoverflow.com. The Welcome Wagon Welcomes You! What immediate changes to tools would have the most impact for new users? Okay, maybe not specific feature requests, but broader groups of them? We know this sounds crazy, but what could really go wrong if we let new users do [thing]? Here’s some draft copy for a stronger code of conduct, does anyone have any feedback? Here’s some shiny new UX mock ups, anyone feel like testing the flow? Anyone free to do a Skype / Hangout interview about [topic]? Of course, there will be more stuff, but that’s the gist of it. The group is super informal and your participation there is strictly voluntary. However, we want to limit the size of the group to the extent that it remains effective and all that have things to say have a chance to do so. To that, we can only accept groups of up to 15 people at a time, in the order that they express interest. We also ask that anyone not able to contribute for more than a week or two let us know, so we can let some others in. If you’re interested, contact Tim Post directly at tpost@stackoverflow.com. If you have a Slack username, please include it in your email. We’re using Slack for a tucked-in corner over Stack Exchange Chat , as we do not encourage the creation of private rooms for personal cliques, even the ones we are championing for the cause of our site. We had no idea how strong the response would be to our latest job opening on the Community Growth team here at Stack Overflow, and we’re quite honestly taken back by just how many of some of the smartest people we’ve ever met (that’s strongly directed at all of you) want to work here full-time. We really didn’t think more than a few folks would apply. Now, we have to make some choices that will whittle down a large group of applicants to a small candidate pool, and then whittle that pool down to a single choice of the person we’re going to hire. That’s not going to be easy, and while we can’t wait for someone to start, we’re surely not looking forward to the number of times we’re going to need to tell many people ‘no’ just so we can tell one person ‘yes’. If you applied and don’t make it through, it’s our fault for not being able to broaden the number of positions we have available to better fit the presentation of a qualified candidate pool that’s much larger than we anticipated. All of you are amazing and as things progress, it’s turning out to be one of the toughest decisions we’ll ever have to make. We are sincerely humbled that so many of you jumped at the chance to put your career future in our hands; we’re truly fortunate to have you, even if we can’t hire as many of you as we’d like. We Mostly Survived The GDPR Kicking In! Some other sites didn’t do so well; we’re pretty thrilled to have the bulk of the work behind us and not be on that list. We wanted to give some guidance on GDPR-related questions that might be lingering, as far as the best place to post them. I have a question about a specific user → Use the ‘contact cm’ feature for any individual user questions (e.g. age related). I have a question about how SE implemented something related to the GDPR → If it requires knowledge of a tool that isn’t public, ask on the Moderator team, or ping Tim directly. If it doesn’t require knowledge of tools, just post on MSE. The [foo] tool exploded and didn’t explode prior to the GDPR work → Bug-related stuff about the tools going wonky post-GDPR can just be filed using the contact form with any steps / account links needed to reproduce the issue. In almost all cases these should probably be handled privately, but we trust your judgement if you think it’s fine to post on MSE. Reiterating that the GDPR is new, we’re sure to see more changes come down the road as the teeth in the law get tested in the courts. We’ll keep everyoen apprised of any new changes in this newsletter that aren’t big enough to announce on the meta sites, when it comes to your tools and how you manage your sites. The “redact revision” tool has been available to moderators for a while now, but oversight of past redactions has been limited to employees. Now, a list of the last 100 redactions can be found via /admin/links under the name “Recently redacted revisions”. This lists the posts that were redacted, the moderator or employee who initiated the redaction, the reason given for each redaction and a link to the flag raised for confirmation (if any; employee redactions do not require confirmation). In keeping with the intent of the tool, any text that was redacted is not shown. The goal here is to provide additional visibility into how this tool is being used. If you have any concerns about how redactions are performed on your site, please talk about it with the rest of your team. If you have any questions about the use of the tool itself, ask them on the Stack Moderators Team. We’re sorry if our recent blog post felt belittling given your efforts; it wasn’t intended to come off that way. If you’ve been struggling to keep your site civil and welcoming despite shortcomings in our software and stalled development on most tools, our recent blog post might have hurt your feelings a bit because it didn’t do a good enough job of highlighting the truly human and compassionate touch that you provide every day. We’ve got no excuses there, just like we didn’t have any excuses in the post. It was a difficult piece to write, and could have been a 10-or-more part series that dove more comprehensively into every point that we brought up in a single post. We felt that we needed to write something that was as all-encompassing and admissive as possible concerning problems that have been festering for a while now; leaving out mention of the work you do every day that glues this place together was not an intentional omission, and we’re sorry that we didn’t shine a bigger light on what you do. That goes for all users that go out of their way to be amazing and helpful people on our sites every day, it just happens that group includes all of you. We know that we’ve got a lot of things going, and while we’re making an effort to be more present for live 1:1 needs, we see the need to consolidate updates that are easy to find and refer to as we do a whole lot of things around updating terms, working on welcoming initiatives (which means shiny new tools coming down the road), and other stuff. We’re going to need your help more than ever as we look at what works, and what doesn’t, when it comes to giving new users the most possible welcoming experience. We feel like we lost some of you along the way in the last few years as we kept encouraging and acknowledging time you were spending suggesting things that could have helped us avoid things coming to a head as far as how new users have been experiencing the sites. We want to get back to working more together and actually putting some metal behind the words to make things better for everyone. We originally built this network around the concept of incorporating a lot of feedback from as many perspectives as we could get, including those that tend to see the worst experiences that folks have, and the reasons behind those. Somehow we stopped listening to that signal as we worked to reach a lot of goals, we consider that to be a pretty big mistake. Part of that means letting all of you know about important stuff that gets discussed, so you don’t miss an opportunity to weigh in on it. To that, we’re going to try to commit to getting this newsletter out twice monthly, even if some issues just contain links to meta posts and feature ideas in an effort to be sure everyone sees them. You’ve probably seen the meta post Tim wrote about more aggressively enforcing self-moderation in chat, and what that might mean for you. Essentially, there’s no new policy being put into play, we’re just going to be enforcing our existing code of conduct more consistently. We want chat to be an enjoyable place where people don’t feel like they need to walk on eggshells, but at the same time, rooms need to do an automatic course correction if it’s pointed out that the culture has become unwelcoming in some way, which often calls into question what isn’t being flagged. It’s hard to define what looks bad in a list of bullet points that translate into specific things people can or can’t say. So we’re not going to. We have a “Be Nice” policy, and it’s even shown to new chat users when they join. It’s something that has to be enforced, and in all directions. Users should be welcomed as they attempt to participate, and treated with respect and dignity. Users should be able to respectfully bring up when a conversation topic leaks into problematic territory or language, and the room should be able to listen to this and acknowledge it accordingly. This respect should extend to everyone, whether new to chat or a regular. Whether the exchange is from a regular to another regular, a regular to a new user, or a new user to a regular, each participant should be expected to behave appropriately and should expect to see their concerns given due consideration. So long as this is upheld, then there’ll probably never be a problem with the room being on our network, and we’ll remain proud to host it. If folks stay in-line with the code of conduct, then everything works keen. If folks stray from it, then actions such as flagging must be taken to rein them in, without breaking out of the code of conduct when doing so. This applies whether those folks are new or old. We know that chat moderation tools need a lot of work, and we’re going to work on them. We hope the above description and info helps guide you until we get better tools to help room owners better set the tone with a system that does a better job of gently nudging folks to stay on the right track. Thank you for your input regarding the new arbitration clause, though there’s still some confusion. How (or even if) this new clause is applicable to users outside of the USA? Are we planning to change our business model to something that we anticipate will make people want to sue? Why have it, if everyone can just opt-out anyway? Why not just make it opt-in? … are still coming up pretty frequently. The meta post is long, and it contains a considerable amount of information that one might use to formulate their own answer to those questions. But, folks really want us to answer these questions more directly, so we will. GDPR is nearly here, there will be more updates coming around that. We’re following the EU regulations blanketly; we’re treating them as law for users in the EU and as hard guidelines for everywhere else. We believe in the spirit of what the law is doing, first and foremost, and being compliant everywhere means less chance of us breaking compliance by maintaining separate standards. Nothing changes about moderation. While the minimum age to participate will remain 13 in the US, it will be 16 in other parts of the EU. There’s nothing in any law that says we need to actively look for under age users, which is a huge relief. If you notice someone revealing their age and you wonder if they’re too young to have an account, just use the ‘contact CM’ feature from the user’s profile and feel free to forget about it. An absence of action on our part can be taken as an indication that we looked, but didn’t find grounds to remove the account. More will come in a meta post set to go out on MSE within the week. We’ve got items from most sites that have received custom designs, and we’ve got a lot of Stack Exchange branded stuff that tends to gather dust in our warehouse. We don’t want to encourage folks to find a way to give it out willy-nilly, but we do want to remind you that it’s a tool at your disposal if you think it could help reinforce your core communities. We’ve had, well, let’s call it mixed luck when it came to offering prizes for content generation. While there have been some pleasant exceptions, sites have typically ended up with, well, posts that look like they were written to win a contest for generating content. We’ve found it’s better to find ways to use the freebies to reward your core users for doing what they do every day. That doesn’t mean you can’t make it fun; you’ve probably seen some contests on Meta Stack Exchange that just asked folks to make silly hats, or draw silly pictures. We’re not suggesting you do that, but a site about workplaces could conceivably have a contest for the best fictional dossier ever created on an employee that HR keeps under lock and key. Hopefully, you get the gist. If you need help planning a contest in advance, or just figuring out what’s available, you can simply post on your meta site. If you’d like to come up with a contest by conspiring with your fellow moderators and then surprising your users, work out the details then get in touch with us via email or in the Teacher’s Lounge to coordinate. Note, in the interest of scheduling, we may ask you to schedule this a bit in advance, just so we know we’ve got coverage on our end to fulfill it, and enough inventory on-hand. Moderators now have access to a list of all recent flags in chat rooms where they’re able to moderate. This list can be found in chat.stackexchange.com/admin/recent-flags (chat.stackoverflow.com/admin/recent-flags for Stack Overflow chat) and offers a list the 100 most-recently flagged messages, along with the number of spam/offensive flags, counter-flags, unsure “flags” and moderator-only flags for each. Chat flagging has been controversial for years, but it’s hard to prove where it’s failing. We hope this overview will not only be a helpful tool for moderators to manage chat, but also help provide insight that may help identify issues with the flagging system. Moderators are free to peruse this list and observe the sorts of messages attracting flags. They may also take additional action if needed, including imposing longer suspensions on persistently abusive authors or lifting automatically-imposed suspensions where unwarranted. 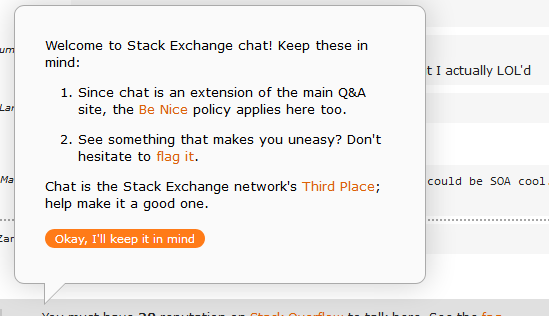 We also encourage moderators to keep the guidelines for moderating chat in mind when reviewing past flags. It’s now possible for moderators to signal their intention to go on vacation via the moderator history page. There will be a simple text field with a button labelled “Record myself as absent / inactive”. The text field is optional but it is recommended to use it to explain the estimated duration of your absence, and if desired, the reason for absence. You can read more information about it in the moderator help center. Moderation is, and always will be, a volunteer activity. Whether you’re an elected moderator of a graduated site, or a pro tem moderator appointed by hand, it’s always your time to invest into the site at your own discretion. Always feel welcome, whether you’re feeling generally overwhelmed, or maybe you just need a break, to take time off for yourself. We hope that this tool will help you feel more comfortable in taking such absences to recharge, rest, or simply deal with the many other facets in your daily lives. For convenience, we’ve now added a direct channel for contacting the community team when you encounter a problem your moderator team is ill-equipped to handle. There’s a new option on the mod menu for the user page, called “contact community team”. Fill this out and it’ll generate a ticket in our support system, automatically including your profile as a moderator and the profile of the user you’re contacting us about, along with the custom message you provide containing the details of the problem. Once received, our Community Ops team will handle it, or will contact you (the moderator) via the email in your profile if any follow-up is necessary. This will allow you to deal with situations like user merges, underage users, and network spammers without needing to leave the page you are performing your investigations from. Read more → Can we have a moderator only “flag for community team/developer attention” link on posts? We introduced a new tool for the Community Team which allows us to directly modify a specific revision in a post history in order to remove elements such as private credentials. This replaces the previous system where we simply destroyed the revisions that contained such information. Redacted revisions will be marked in red text (visible to moderators only) as “redacted by [Team member]” in the revision history of the post. We will be using this tool going forward whenever you contact us to remove sensitive information from a post’s history – something you can now do using the “contact” option described above! Statistics on closing on your site can now be found as part of the 10k tools. You can find these either by heading to /tools/question-close-stats. Alternatively, you can find them from “question close stats” found in the links section at the bottom of the Close view in the 10k tools. It’s important to keep an eye on how off-topic is being used on a site. If good questions are being closed incorrectly, the predefined reasons may be too vague; if too many bad questions are being left open or closed with “other” (custom comments left by the close-voter), then you may have picked the wrong reasons. If you see something amiss, don’t hesitate to bring it up for discussion on your meta. More information on the specific statistics can be found at New 10K tool: question close statistics. Close votes, reopen votes, and close flags now begin aging away a maximum of 14 days after the last vote cast, regardless of the view count on the post in question. Previously, posts with a lack of views would not trigger close votes aging away until at least some minimum number of views. In practice, this only partially addressed the problems it was meant to. Stuff that really needed review would sit stagnant, and the longevity it offered to an individual’s vote did not make much of an impact when the post remained unseen by the right folks. On the flip side, things that probably didn’t need to get closed would simply slowly but steadily gain unnecessary close votes. To help accommodate the situations where a post doesn’t get enough attention during the first round of closing, users who vote to close or reopen will be able to recast their votes if their vote merely ages away. This way, rather than a post simply sitting in the respective queue forever, voters can essentially “re-queue” the post for a fresher look. Note that voters must wait 14 days after the vote ages away before re-raising it, and each time revoting will still consume one of a normal user’s votes per day. Related FAQ → When are moderator flags automatically dismissed as “aged away” by the system? Users, including moderators, are now prohibited from deleting a question which is currently the target of one or more duplicate closures. This will help prevent unusual dead ends where a user comes across a duplicate question, only to be confronted with a non-existent page being pointed to. This prevention is absolute and can only be resolved by removing the duplicates that are pointing to the question – whether this would entail reopening the questions or deleting them will be based on the particular situation. Upon attempting to delete a question that is shielded in this fashion, the user will be presented with a pop up informing them of the inability to delete the post and the means to which it can be alleviated. The pop up also includes the option to view all posts that currently contain a link that points to the post they attempted to delete. This does include posts which are not actually pointing to the question as a duplicate – the ones that do, however, are easily identified by their status as being closed with [duplicate] in their titles. Very Low Quality and Not An Answer flags do not enter the moderator queue for 15 minutes after they’re raised. This applies network-wide, except on Stack Overflow, Mathematics, TeX, Salesforce and Stack Overflow em Português (where the delay is a full hour) and meta sites (where they enter the queue immediately). This delay gives the community a chance to handle these flags first. If that doesn’t happen, or if it can’t happen, then it is made available to moderators for resolution. Keep in mind, not all posts can be processed via review, and when a post is processed through review but continues to garner flags the system reserves these for moderators. Therefore, when you do see these flags in the mod queue, you should handle them – it’s unlikely anyone else will. You can now reach a user’s chat profile by heading to http://chat.stackexchange.com/accounts/[networkid], where [networkid] corresponds to the user’s Stack Exchange Network ID. You can determine that value from a user when visiting their profile page on any site by clicking “network profile” in the top right (or if your browser supports it, hovering over the link to view the URL), and copying the number from the resulting address. If the user does not actually have a chat profile linked to their account, you will instead be directed to a 404 page when you input that network ID. This route is available for anyone to use, it is not moderator-only. It is, however, most likely to be of use to moderators when trying to determine a user’s chat identity for the purposes of superpings. We’re considering how to integrate this directly into the profiles, rather than requiring a manually input URL.